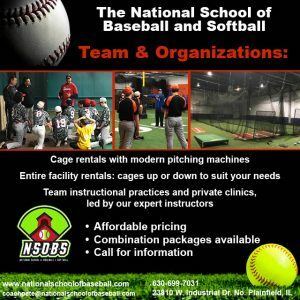 The very foundation of our success and growth for over three years has been and always will be expert/elite training in baseball & softball skills, both physically and mentally. The way we have gone about that, I think, is unique. We take great pride in our backgrounds, education and passion for the game and God-given ability to teach. To teach in a manner that is effective, inspiring and fun. To teach in a manner that all students, regardless of age, will walk away knowing they have the tools to become the best player they can possibly be. How we go about that is with: continuous positive reinforcement, patience, calmness, educating, demonstrating and motivating. Hence our motto: Educate, Demonstrate, Motivate, Create. We never tell a student or player to just do something. We explain in detail why and we demonstrate. What we do not do to either our students or team players is punish anyone with physical activity if they make a mistake or are not learning at a fast-enough pace. We do not yell. We do not raise our voices. We never demean, degrade, insult, name call or anything like that to anyone. As the leader of this organization, any instructor or coach who demonstrates this type of behavior will be terminated immediately. For the NSOBS, that type of teaching or coaching is so unacceptable, it carries a zero-tolerance policy. Personally, I have witnessed this type of instruction and coaching far too many times. In my opinion it is bullying. If bullying is not allowed in schools, it should not be allowed in sports instruction. It’s just that simple. No player wants to walk about from a lesson or practice feeling horrible about themselves, regardless of how they performed. We want and get SMILES!! If this is the type of atmosphere you want your young player to learn in and play in, then give us a call. We love new students. And our 16U Girls softball team still needs a few players to fill out the roster. Wishing everyone a very Happy and Safe Thanksgiving! Hope to see you all soon! There has been and continues to be a major epidemic throughout baseball starting at ages as young as eight years old. That epidemic is over-pitching or “abusing” young pitchers, using them repeatedly all for the sake of winning. This is not only ruining young pitchers, but is ruining the sport. 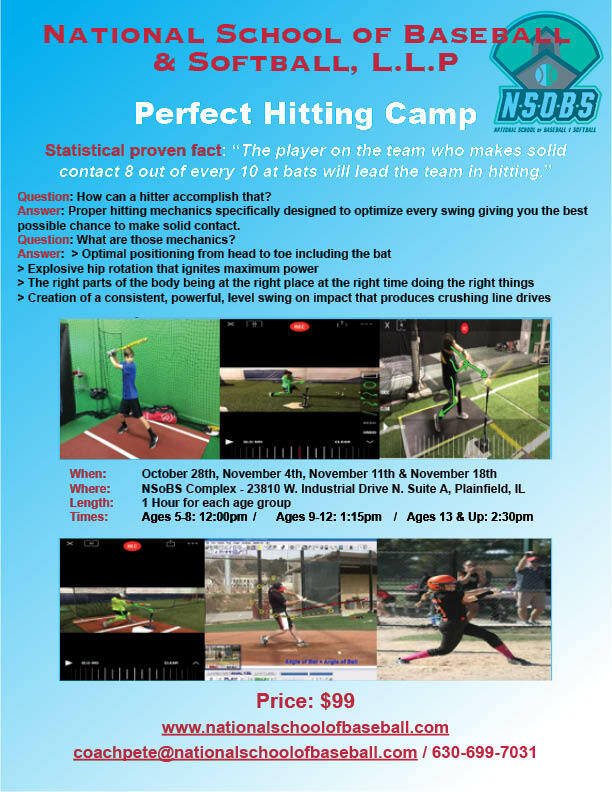 I have not only personally witnessed this on many occasions, I have heard dozens upon dozens of stories where pitchers of all ages are being asked to throw astronomical amounts of pitches with minimal rest. What is the cost? The cost is the life of that young pitcher’s arm and possibly his career. Every arm only has so much life in it and when you abuse it, the length of that life drops drastically. Plain and simple, what coaches are doing is stealing a young pitcher’s future all for the sake of winning a trophy. This “innings pitched” rule in tournaments and leagues is not enough. The limits must be pitch counts. There have been enough medical studies out there determining what is SAFE and what is not. I am watching the Little League World Series right now. They have it right. Any pitcher who throws 66+ pitches must have four days off. Note. It is NOT innings. It is pitch count. I will give you an example of what I am talking about. A travel team played five games in four days, then the next week another five games in four days. Two pitchers threw the maximum allowed two innings every single game! That is 20 innings pitched in about 10 days. An average pitch count for a good inning is 15-20 pitches. Do the math. That’s 200+ pitches in 10 days at the ages of 9-12. Yes, there was rest from Monday through Thursday, but that was after the damage had already been done. 40+ pitches three consecutive days is flat out “ABUSE”. I even heard and assistant coach tell a head coach to not pitch a kid because he was hurting. He had ice on his arm after every game due to being in pain. The Head Coach relented saying, “I am the Head Coach. I decide who is pitching and he is pitching!” And the parents just sat back and let it happen. To put this in perspective, a major-league pitcher will throw anywhere from 80 to 100 pitches per start. They get four days rest in between. And these are freak athletes with incredible strength and stamina. They are also being paid tens of millions of dollars each year. A professional relief pitcher, even closers, will hardly ever appear in more than three games in a row. This epidemic needs to stop. The winning at all costs attitude is nothing but abuse when it comes to pitchers. In my mind, there is zero genuine caring for the welfare and well-being of the player. This to me is sick. Coaches and parents (they are just as responsible) are literally stealing the future from young pitchers…. before it even has a chance to begin. You don’t believe me? I will give another example of a young pitcher I know. He was abused for so long at such a young age, that by age 12 he was in so much pain, he went to a specialist who in the ends said, “Your pitching career is over”. He will never pitch again! And for what? A Trophy that collects dust on a shelf? You don’t have enough pitchers? Develop them. You don’t know how to develop them and teach safe mechanics? Hire someone who does. Don’t let a doctor tell your son, “Your pitching career is over,” because his arm is damaged beyond repair due to abuse. PLEASE!! 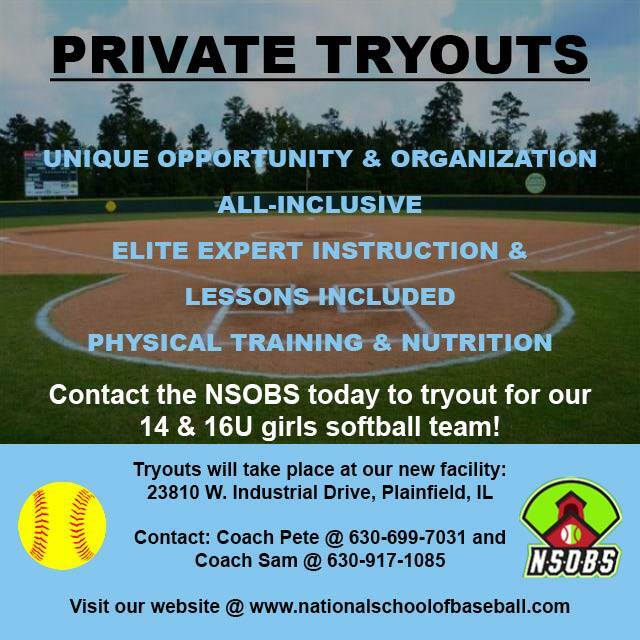 The National School of Baseball and Softball is proud to announce it will be hosting private tryouts for a 14U and 16U Softball Team. Tryouts will be held by appointment on Thursdays until the teams are filled. To schedule a tryout, contact Coach Pete at 630-699-7031 or Coach Sam at 630-917-1085. 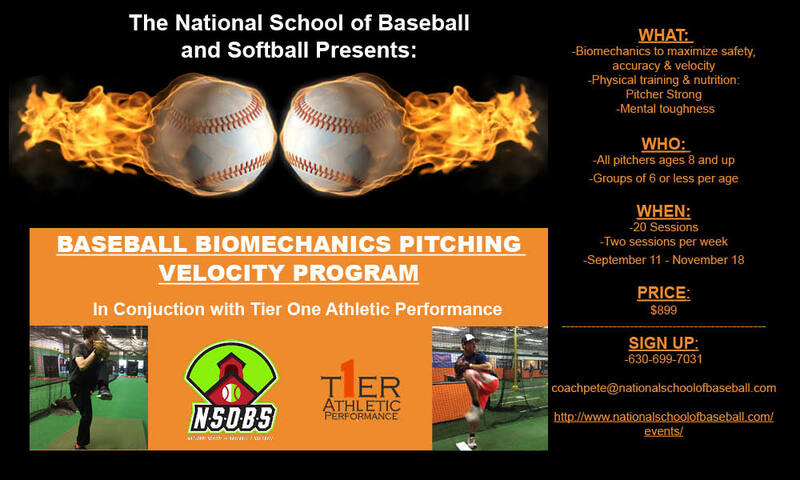 The National School of Baseball and Softball, in conjunction with Tier 1 Athletic Performance, is proud to announce its Biomechanics Pitching Velocity Program. Join us for 20 possible sessions – twice a week for 10 weeks (makeup dates available). Sessions are 90 minutes long. Who: Small groups of six or less based on age. 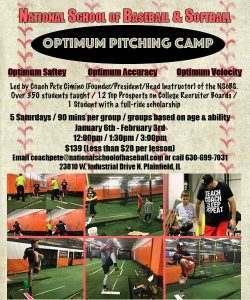 Pitchers 8 years and older welcome. Purchase Batting Cage Rental time! 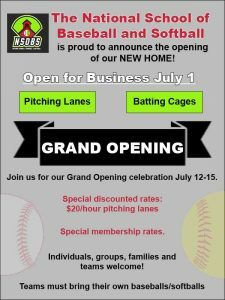 Batting Cages & Pitching Lanes Available For Rent. Pay as you go! 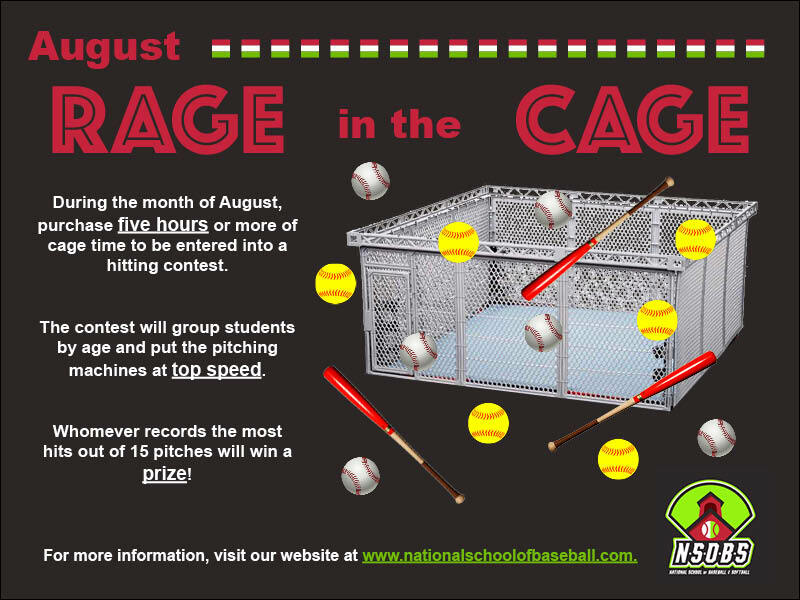 Purchase one of our two packages & Enter our RAGE in the CAGE competition! 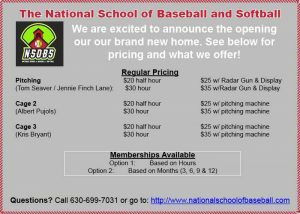 © 2019 National School of Baseball.